Barihunks calendar model Romain Dayez a few interesting performances coming up on his calendar. On November 28 and 29, he'll perform in Handel's Judas Maccabaues at the Collège Don Bosco in Brussels, Belgium with the vocal ensemble Cantus Firmus and the Brussels Chamber Orchestra. In the opera, the king promises his dying wife only to remarry a woman as beautiful as herself. He decides that the only woman who can meet that standard is his daughter, Horrified, the daughter seek the advice of her fairy godmother, who tells her to create marital demands so extreme that they can't be met. She demands that she be given three dresses made of immaterial materials. The first is to be made of the “sky” and should be as light and airy as the clouds. The second is to be made of “moonbeams” and should reflect the same lyrical intensity as the moon at night. The third, and last, is to be made of “sunlight” and should be as blinding and warm as the sun above. The opera also involved a donkey that poops gold and a prince who saves the day. On January 17, he'll join accompanist Charles Mignot for a recital of music by Fauré, Franck, Chausson, Saint-Saëns, Ravel, Caplet, Boulanger and Poulenc. The performance will be at the Musée des Instruments de Musique and tickets will be available at the door. 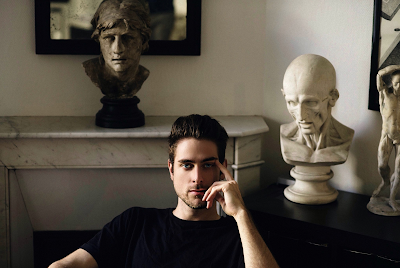 You can enjoy Romain Dayez in the 2016 Barihunks calendar along with 17 more of opera's hottest men. You can order before the holiday rush HERE. Proceeds will fund a song prize for baritones/basses, as well as commissions for new music.